A blog is simply a website in which each page of the site is generated dynamically by a content management system. Most blogs are simple chronological diaries which allow a writer to easily post new content to their website without requiring any web design knowledge. Other blogs like this one have been heavily customised and modified to fit their purpose. I get a lot of queries about how I created Mike on Software, what blogging software and plugins that I use that it’s worth a blog post. Mike on Software is coming up to the first year anniversary so it is fitting to see how far it’s come since then. If you’re interested, my first ever blog post from August 5th 2007 is here. If you’re just getting started with your blog, I highly recommend signing up for a blogger account. Blogger now owned by Google is your quickest route into the blogosphere, almost guaranteeing that your posts will be indexed and picked up by Google and other blogs without requiring any SEO work on your part. TypePad also comes SEO optimised, but isn’t part of the Google network of products. Ultimately if you’re blogging for the first time with little or no IT expertise, go with Blogger. I personally find Blogger sites to be a bit ugly and generally limited. TypePad seems to be very well supported with social networking and news sites with buttons to “Blog about this news article in one click”, so if you’re a budding news commentator a TypePad blog might be best for you. However if you’re planning any sort of extensible and powerful blog, WordPress is currently as good as it gets. It’s open source and very well supported with some excellent third party plugins (a lot of them are free) to do most of the things you’d ever want to do with your blog. WordPress also supports a large number of templates and you can switch between them easily. I started my blog last year with a WordPress self-hosted solution. You need to self-host if you want to make any changes to the core files, database or do all the clever stuff. Luckily, getting WordPress hosted on a Linux host is very easy. Hosting WordPress on Windows is a little more difficult. WordPress is a PHP-based solution and uses a MySQL database. It works best with Apache but IIS 6.0 or 7.0 can be hacked to work with it. Our last webhost was Dewahost, an excellent high performance business class Linux web host with a CPanel interface. However since we moved to a dedicated Windows server the blog had to be migrated to. PHP needs to be obtained from www.php.net and MySQL from www.mysql.com. Both are free. I’m not going to go into the installation here, but it is worth a mention for those about to try a Windows installation of WordPress is that if you want to use “permalinks” to optimise your website URL’s for search engines you have some work ahead of you. WordPress supports dynamic permalinks by using a technique called mod_rewrite which is supported by Apache but not by IIS. If you wish to use WordPress permalinks on IIS you will need to install a third party IISAPI (Internet Information Services Application Programming Interface) component for each blog you set up. To obtain the latest WordPress PHP files, go to www.wordpress.org (.org for the self-hosted site, .com for the hosted site). The biggest benefit of using a CMS (Content Management System) blog package is that all your site content is exposed to the Internet via XML feeds which RSS readers can read. If you don’t know what I’m talking about, Google for RSS. It’s a technology that allows you to use blog and news reading software to monitor “feeds” from lots of different sites. I personally have over one hundred RSS feeds set up for national and local news, technology blogs and other news sources. 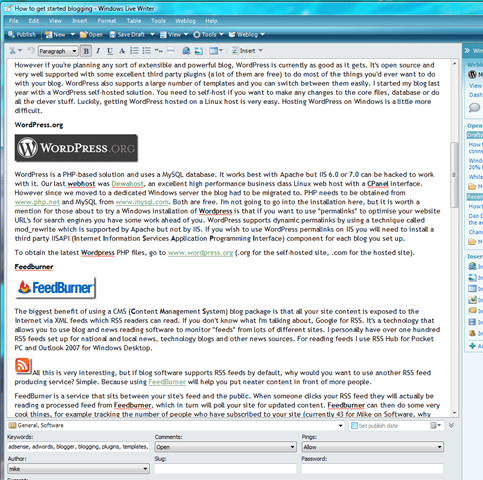 For reading feeds I use RSS Hub for Pocket PC and Outlook 2007 for Windows Desktop. All this is very interesting, but if blog software supports RSS feeds by default, why would you want to use another RSS feed producing service? Simple. Because using FeedBurner will help you put neater content in front of more people. FeedBurner is also capable of handling email subscriptions for your feeds too, in case your target audience doesn’t use RSS readers. And most vitally of all when FeedBurner receives content it can send it out to internet aggregator services such as Google, Technorati, Ping-o-matic, Syndic8 and Alexa. You can also insert advertising into your feeds. I don’t do this as I already have a few tidy Google Adwords on the main site and don’t want to clutter a feed with advertising. I was using a mixture of different SEO techniques for optimising Mike on Software but I was pleased to replace a dozen plugins and custom code with a single easy plugin by Michael Torbert. Once your blog starts to become more popular you’ll begin to attract the attention of the Sploggers and other users who will syndicate (i.e. copy) your content without your permission. Historically the only way to determine if your content was being I made a post about this plug in here. Adds a breadcrumb navigation to the blog, showing you the path you have taken to your current location. Makes it easier to find other similar posts too. All-in-One SEO Pack doesn’t create XML Sitemaps. These are used by search engines (specifically Google) to assist the crawl your site. A PHP form to operate as a contact page. Let your visitors share a post or page with others. Instantly allows your visitors to send the post as an email or submit it directly onto social networking sites. Provides one button for each of the syndication and social networking sites that a user might want to submit to. There is some crossover with ShareThis but I find that my posts are more likely to be submitted to Digg or SlashDot via a user clicking the Digg or SlashDot logo than they are through the ShareThis window. Allows readers to receive notifications of new comments that are posted to an entry. Useful for those readers asking me questions on my “how to” type articles. My only paid-for plugin. This plugin requires a fair amount of work to get integrated, but once implemented it will generate thumbnails for your posts automatically. Tracks views, post and page views, referrers and clicks. Identifies when a user is using a mobile device (if the mobile browser identifies itself as a mobile device) and reformats the site content to fit the device. A very useful plugin. Add an AJAX-style post rating system. Requires a little work to implement. Now updated for version 2.0.4 it is extremely easy to use and customise. Shows related content via a customisable algorithm. No longer used but may be useful for you! Shows you earnings from Adsense. Since I only earn a few cents a day if I’m lucky I don’t bother with this. The Google advertising does help with hosting costs (every little helps). Hopefully one day it might increase enough to buy me a beer. Inserts contextual Amazon products into your blog. I removed this as I found it annoying. Some people actually make money from it though! Disables the “nofollow” attribute for all user comment links. In other words, lets you use your blog’s pagerank to benefit commentators of your blog. I use the All-in-One SEO pack to redirect requests for my blog’s feed to FeedBurner. This plugin does the same thing. Got a Flickr photo account? Want to show random or set images from your Flickr account? Use this plugin, it’s great fun. I removed it since I need the room for tech content and not more photos of my cats. A simple plugin to use your categories and tags to make those HTML META keywords that search engines used to love so much. In an attempt to start some rivalry amongst commentators I used this plugin as a league table for commentators. However it backfired; I like to reply to people commenting on my blog so I was always the top commentator. Which kinda defeated the purpose. Do you like random quotes? You’ll like this. I’ve implemented some fairly sophisticated caching of this blog in PHP and IIS (I’ll go into this later) and turned WP-Cache off while I tested this. I haven’t had time to activate WP-Cache again. It’s a great plugin which will shield you a little from the Digg effect as it stores copies of requested pages in a cache and doesn’t dynamically generate them for every visitor to the same page content. I use a heavily modified version of the Revolution Theme (http://www.revolutiontheme.com/ $79.95 per site – purchase via my link to buy me a real beer at no cost to you :)) with additional support to create the thumbnails from Viva Thumbs ($14.99 per site). If you’re seriously serious and have the skillz go and take a look at Revolution. If you’re lacking lots of time and PHP skill, I would strongly suggest avoiding magazine-style themes and sticking with a chronological/diary theme for the moment; magazine styling doesn’t suit everyone. If you’re someone who likes to blog regularly and use images, video or audio in your blog you should take a look at Windows Live Writer. 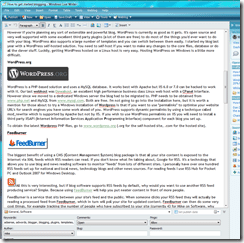 It is an excellent free piece of software that brings a more Microsoft Word / WYSIWYG experience to blogging. You can copy and paste images, video and audio directly into your blog. You can also resize and edit photos, apply watermarks and prepare your post for uploading by setting all the META data (e.g. tags and categories) from within Live Writer. I like to upload from Live Writer as a draft for one last online proof read, but if you’re in a hurry it is possible to publish directly from the desktop. If so, please leave some love and vote the article the number of stars you like at the top of the page. Also feel free to leave a comment. If you want to hear more, let me know please. Good post, some tips i’ll be looking into when i get a mo. My Blogger account is good and I would rate it higher than a 1 for ‘Customisation Potential’. Not the same as ‘Ease of Customisation’ though if you get my drift! Even for proficient code monkeys, Blogger templates can be confusing. What I’m getting at regarding customisation potential is that WordPress is not only very straightforward (as straightforward as PHP/MySQL can be), but it’s also completely open source and you can change and customise the code almost totally, breaking the ties to the WordPress source tree. I know a few sites that have done this. Also from within a basic WordPress installation it is possible to edit the PHP code of all the template files directly from within the WordPress control panel – a nice touch. WordPress also seems to be better supported than the other blogging platforms with far more plugins and templates to be found online than the others. If I was creating another blog, I’d use WordPress; unless I was in a hurry in which case I’d probably switch to Blogger. WP is actually pretty good SEO wise out of the box. Themes (particularly freebies) are often the sticking point. Poor code et al. IMHO the mistake most blogs make is trying to hard and duplicate content. Not because of the ficticious duplicate content penalty – but rather because of duplicate content filtering in the SE’s. Bunches of stuff ends up just rotting when it could be utilized more effectively by planning what one wants indexed and how. I haven’t tried the Yoasts SEO plugin, how does it compare to The All-In-One SEO Pack? I’m still using the “All in One” pack and have been for the past three years now; it’s very good (especially after several years of iterative releases) and when combined with a decent caching plugin, it’s going to be hard to beat. Yoast documented his reason for building it was the spurious “all in one” claim others made. You can track the traffic >= after adding on even a moderate trafficed site in terms of organic search (especially implementing his suggestions – not kidding).